This Sunday, November 3 is National Sandwich Day and Dunkin’ Donuts has just what you need to celebrate this fun food holiday. Our breakfast and bakery sandwiches, which include better-for-you choices on the DDSMART® menu, provide our guests with a variety of delicious options and are always available throughout the day. To expand our sandwich menu and to kick-off this holiday, we’re unveiling our new Spicy Smoked Sausage Breakfast Sandwich. We’re also giving our fans a way to celebrate National Sandwich Day with our “Wich is Right” Twitter Sweepstakes. Get ready for some sandwich trivia questions for a chance to win some Dunkin’ dough! Our menu offers a diverse lineup of sandwich offerings that are served fast and freshly-prepared. For breakfast sandwiches, guests can customize their sandwich with some of their favorites like cherry wood smoked bacon and ham, and enjoy it with an egg served on a croissant, bagel or English Muffin. Also, some of our breakfast sandwiches are DDSMART®, better-for-you choices that have fewer than 400 calories. Our Turkey Sausage Breakfast Sandwich and Ham, Egg and Cheese on an English Muffin are hearty and packed with flavor to help keep you running throughout the day. For our guests who are on-the-go later in the day, Dunkin’ Donuts’ bakery sandwiches pair perfectly with a Dunkin’ Donuts Iced Coffee or Iced Tea. Our sandwich selection includes Ham & Cheese, Turkey Cheddar & Bacon, Chicken Salad and Tuna Salad sandwiches, which can be served on a French roll, bagel or croissant. 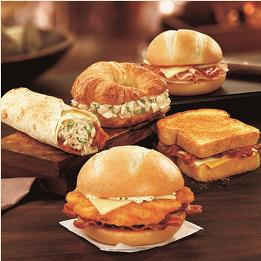 We recently expanded our bakery sandwich menu by offering two varieties of chicken sandwiches, Bacon Ranch and Barbecue. Both sandwiches are served with a lightly-breaded chicken breast and topped with cheddar cheese and served on a French roll. To kick-off the celebration of National Sandwich Day, Dunkin’ Donuts is introducing a Spicy Smoked Sausage Breakfast Sandwich. 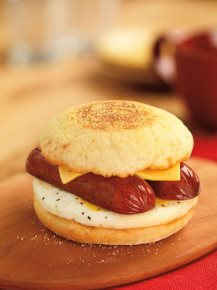 Available for a limited time, this delicious sandwich features a spicy split sausage link with egg and American cheese, served oven-toasted on an English Muffin. Beginning Friday, November 1 and continuing through National Sandwich Day on Sunday, November 3, we’re launching a special “Wich is Right” Twitter Sweepstakes where we’re asking our followers to put their sandwich smarts to the test! Each day, followers of @DunkinDonuts on Twitter can answer two multiple choice questions about sandwiches, using the special hashtag #DDSandwich. The first question will be asked at 10 a.m. ET, and the second question at 11:30 a.m. ET. For each question, one participant selected at random will receive a $100 mGift to help keep them running on Dunkin’ Donuts Sandwiches long after National Sandwich Day is over. For additional terms and conditions related to Dunkin’ Donuts’ “Wich is Right” Twitter Sweepstakes, visit here. Are you exciteDD for National Sandwich Day? Tell us on Facebook and Twitter!